We usually try and keep our posts very positive and look on the brighter side of things here. We are truly blessed and consider ourselves happy to be here and be doing what we are doing. Sometimes though, there are things that need special prayers, not only for our ministry, but for this mission field. Cameroon is blessed in many ways, and a great country to be in for many reasons, but there are some concerns that we would like to share with you, just to keep praying about. 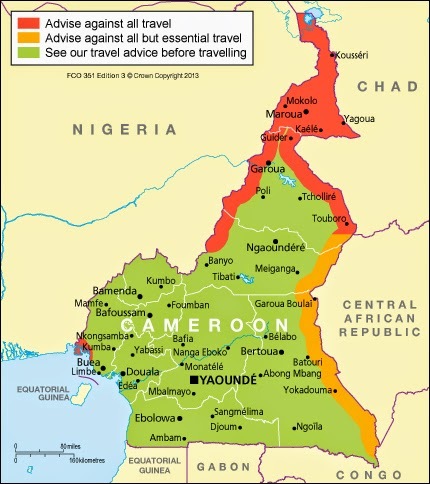 Here is a picture from Britain's foreign office advisory page on Cameroon showing the areas that are under threat. The area in the south in red is about 50 miles away. The threat there is rather due to former war with Nigeria over the Bakassi Peninsula as well as due to the pirates that roam in that area to hijack boats coming from and going to Nigeria. We believe in the power of prayer and in the difference that you can make. 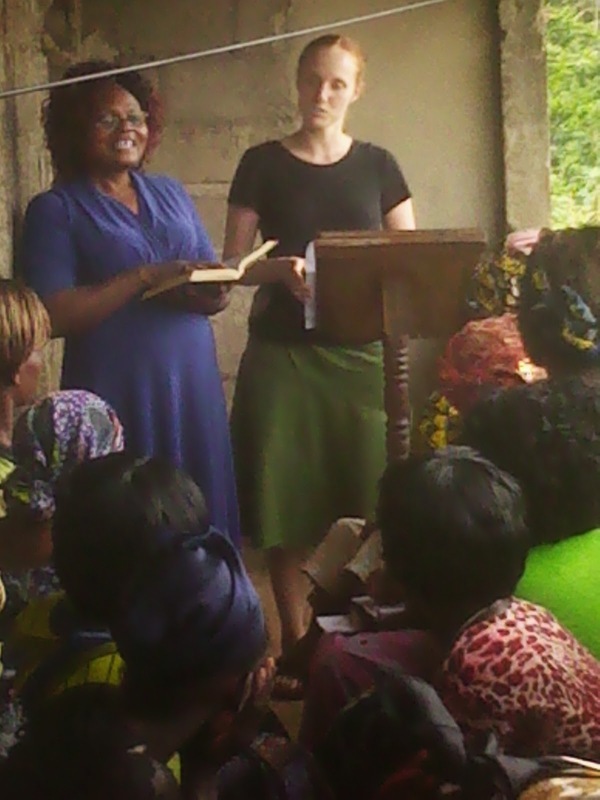 We are grateful to be here in Cameroon and to be able to serve as we do. It is a beautiful country which we love for many reasons. We share these concerns for you to keep in your prayers because we believe that your prayers DO change things! 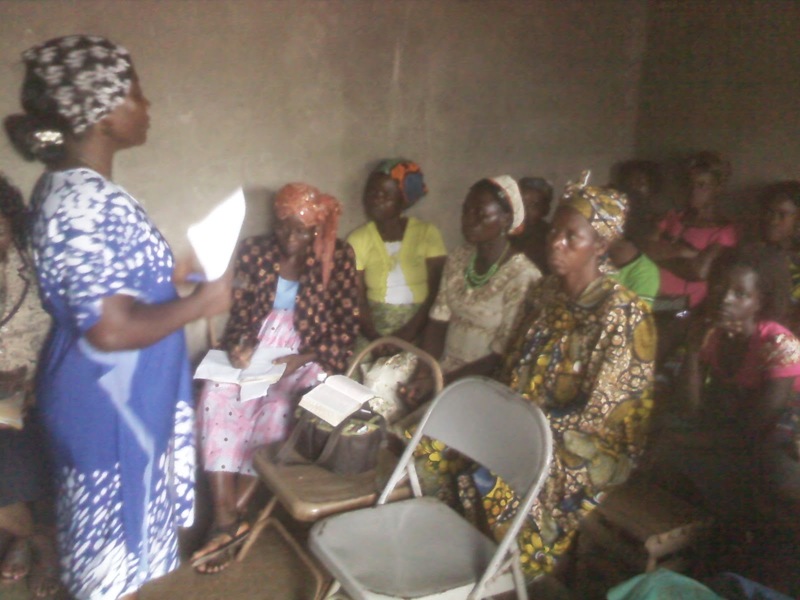 Please continue to pray for Cameroon and to pray for us so that God will enable His work to be done. 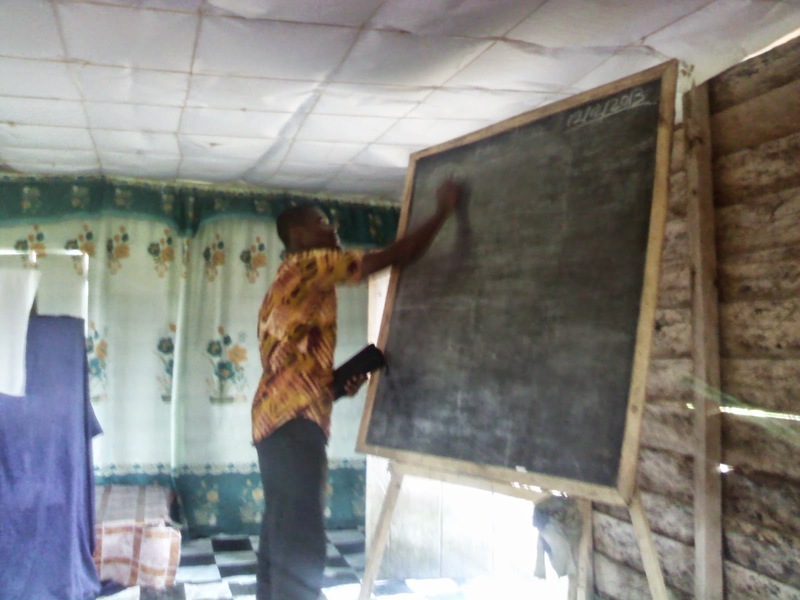 A few weeks ago, we posted about our plans to renovate our garage and turn it into a classroom for our little school. This is helpful because: A. It has more space, B. People don't have to come into our house to visit the school, which is better for security, privacy, and is also more professional, and C. It would have lots of light and in general be a better classroom. So, after about a month of work, and thanks to some generous contributions from individuals and congregations, we are done with the renovations! The before picture I shared some time ago. Note the collapsing door, the shuttered up windows, the rough flooring and the ceiling. Work started with removing the door and building a wall. We hired a mason who is a brother in Christ to help us. The old ceiling had to be torn off and a new ceiling framed up. The floor was very rough and prone to sweating, so we decided to put down tiles. These are easier to keep clean and also, unlike a plain concrete floor, doesn't sweet, which is important in a place as wet and damp as Buea is. It also looks really good. Some of the work we did ourselves, like touching up some painting. I'm not a terrific handyman, but it was fun to do. Our kids are always happy to help out with the ministry! Hannah helped me clean up paint drippings from paining. "Over here, no... over there... well maybe not..." George and I helped set up the furniture, arranging and rearranging it to get the best use and look out of our classroom. The "end product" (as far as renovations go) looks pretty sharp! We are still working on organizing and arranging. We can easily fit 8 student in here, and in time 10 (12 if we REALLY squeezed it). That means that it can fit our whole school for the next couple of years! We already have 7 students (including our kids) lined up for the coming school year. We are really excited to be able to start teaching and transforming lives! 1- Getting chairs. We'd like to get 8 matching, good quality chairs. They are about $30 a piece. 2- A white board. We've already gotten funds for this, and hope to get one in the next week or two when I go to Douala. 3- A computer and computer desk. This has also been funded, and I hope to get one next time I go to Douala, as the prices there are better! 4- A photocopier. This has been partially funded, but we are still saving up, as they are very expensive here (about $1500... we are 1/3rd of the way there). We plan to start full-time classes in September! Thanks for all the prayers and support, and we will keep you posted with updates! So, here are 10 benefits of going to the gym that I have either read about, was told by a professional trainer or have personally experienced. There are many more reasons than these but this is a start. 1 Corinthians 10:31 "So whether you eat or drink or whatever you do, do it for the glory of God." Hey All! It's been a little while since our last blog post, and I thought to share a few pictures that have been "living" on my phone for a while, various things that we've been able to do and be a part of recently. 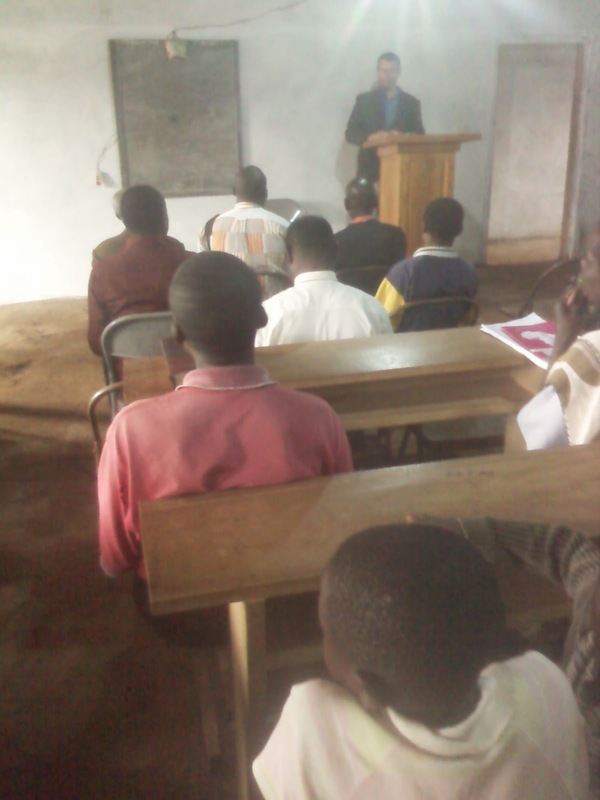 Towards the end of June, we were invited up to Batibo, in the North West region of Cameroon to take part in a preaching/teaching seminar there. The theme was 1 and 2nd Timothy, and I had the privilege of teaching from I Timothy 4. It was an encouraging time, and I can say I learned as much as I taught, as the other speakers did a great job as well. 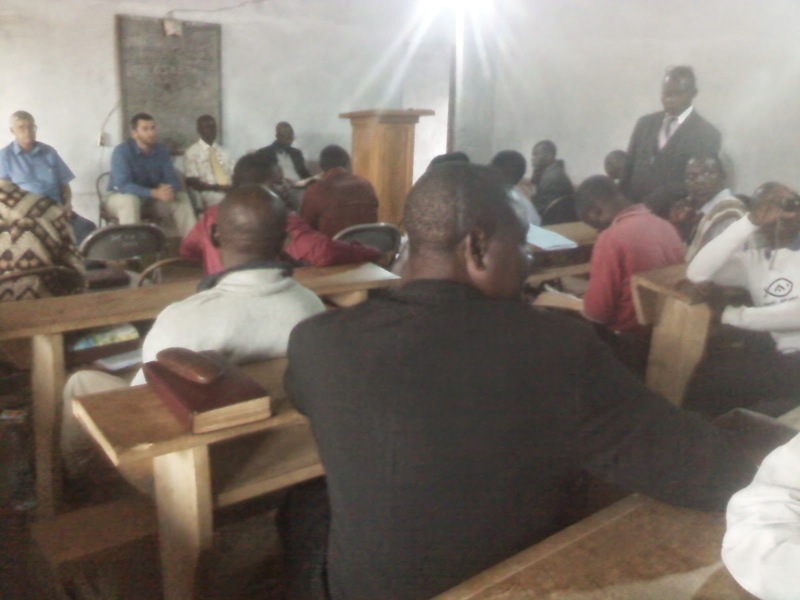 At Batibo, the men and women's sessions were divided. Brittney was asked to teach about the Inner Beauty of a Woman of God. She did a great job (from the little I heard- I just popped in for pictures). It was also good to see some of our American missionary friends and spend some time with them. has been an encouraging time for us both. Ouch! Some weeks ago, Abel and I met for our weekly Bible study, but I could tell that Abel was just not feeling well. 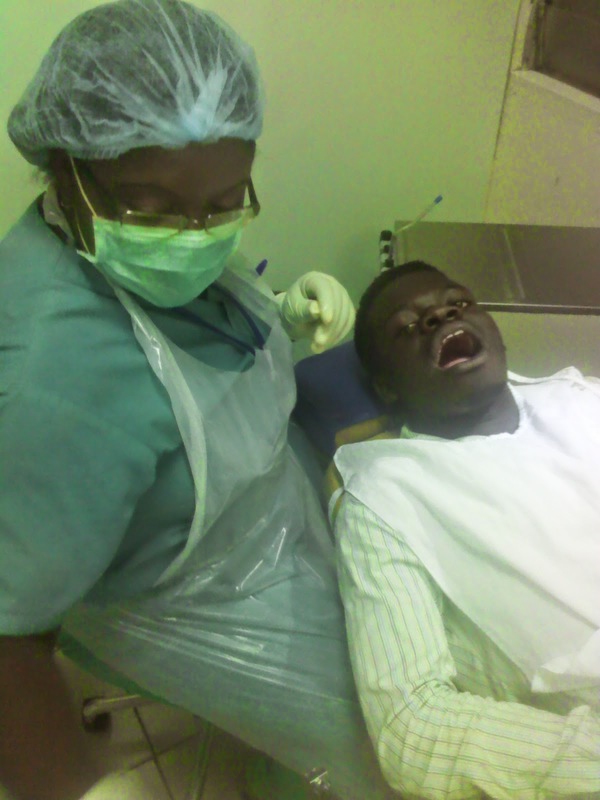 He had a toothache for a while but wasn't able to afford treatment, and so it had gotten so bad that he couldn't sleep at night. I took him down to the dentist to get it checked out. 3 of his teeth were cracked and in need of root canals. Well, with no insurance and no family to speak of, Abel had no way to take care of it, and so we helped him cover the costs. Thank God, he has had all three teeth repaired and filled and is now pain-free! Mile 16 Church of Christ has been one of our favorite congregations to visit for some time. They have been growing over the past two years, and so decided to put up an extension on their wooden building. We offered to help out a little bit, as they were doing the majority of the work. 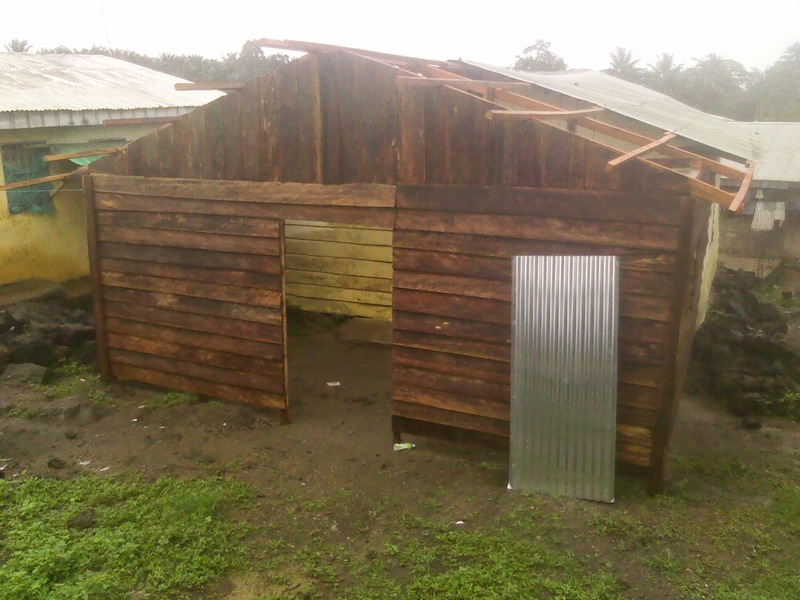 We were able to get some roofing sheets to help them out. They have almost completed the work. Thanks so much! 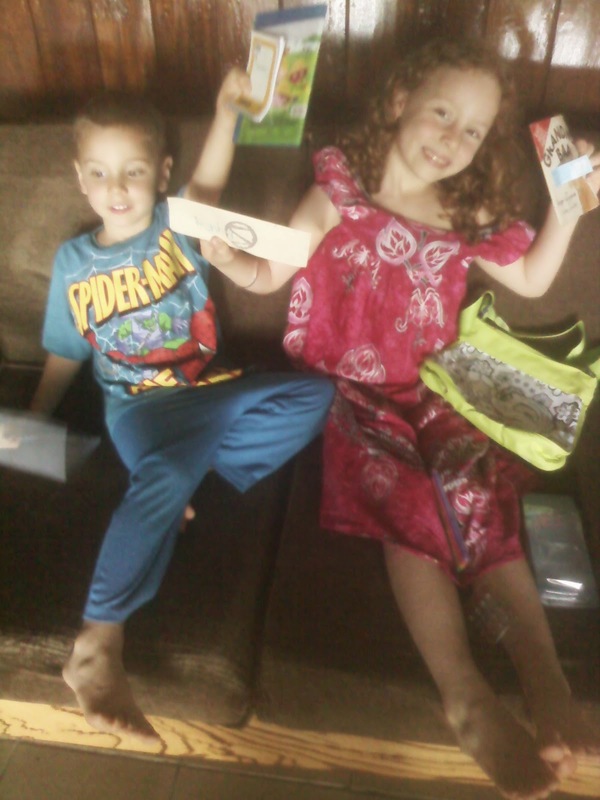 It is always fun to get packages in the mail, especially for our kids. Some of our dear family and friends (in other words, you guys!) sent them some fun art projects and also a bunch of books. Once again, thank you! It is very encouraging to know people are thinking about us! God bless you all! Warning: Rated G for Gross! Warning! Rated G for Gross! A mango worm is being dug out of my skin by Dr. Trixy. Can you see the head popping out? These are very common during the mango season. When you hang your clothes out to dry these little worms drop on them from the trees. Then when you put your clothes on they burrow into your skin and as they grow it becomes painful. At first you think it's just a pimple then I thought it was a boil then as Dr. Trixy speared the worm and hooked it out I realized it was a squiggly iggly worm living under my skin! I think I'll be putting my clothes in the dryer for the rest of the mango season. We took this picture in the village of Bolifamba. Almost every time my husband goes to this village to preach we see a dog roasted whole nearby. We can smell the hair burning from inside the Church building. Shewweee! 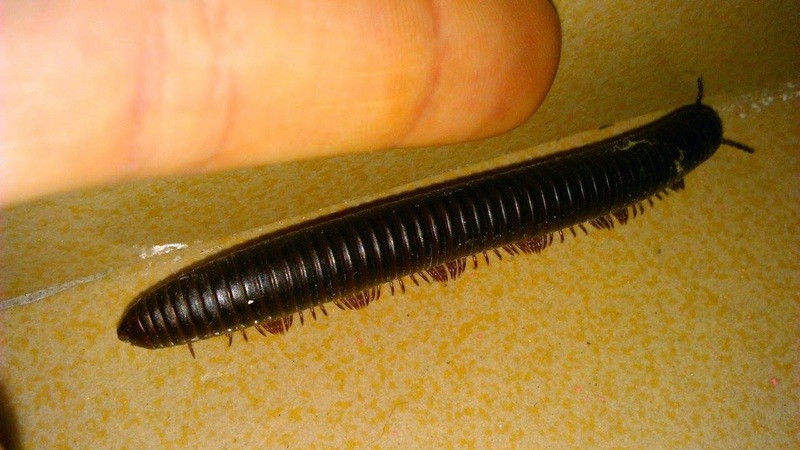 We find these millipedes in the house almost everyday! The kids have fun playing with them but I ask them to kill the colorful ones as they may be poisonous. This bug is called Ngok in the village we live nearest to. We found a lot of them on our porch after a big rainstorm. Ngok are salted and fried as a nice treat for the people here. If John the Baptist can eat locust and wild honey I think I could try some fried Ngok! Yuck! Look at those legs! 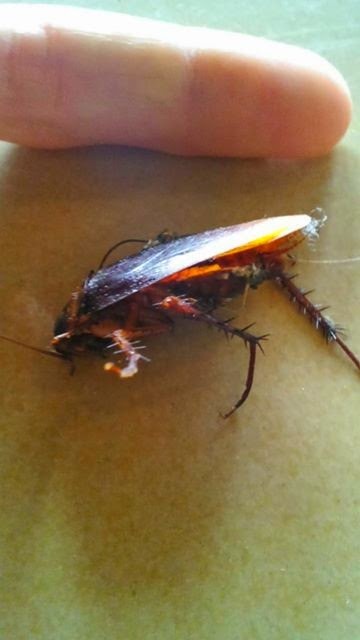 I have lived in 6 different homes in Africa and all of them have had these big roaches pop up from time to time. Now these I would NOT fry and try! 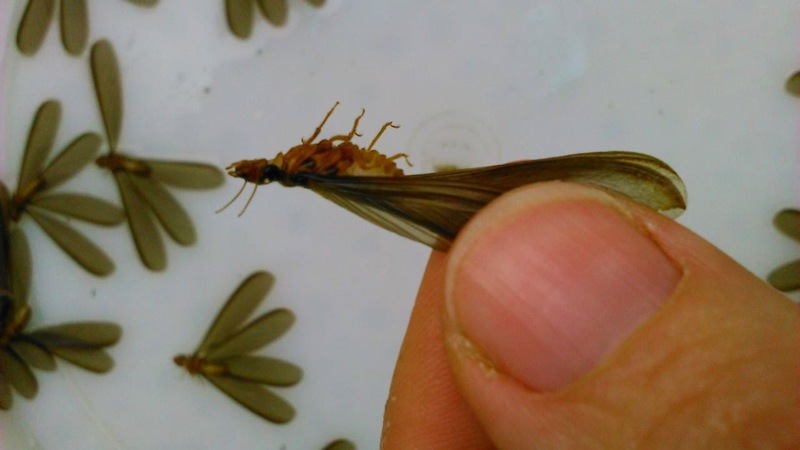 There are several other critters we find in/near the house such as mosquitoes, ants, spiders, poisonous moths, geckos, snakes and such but they are too small or too fast to get a good picture of. We get pretty used to these sorts of things, so much so that we often don't even notice them... it's just a part of living over here and doing the work we do.